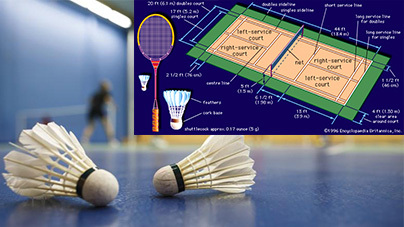 In 2006, International Badminton Federation (IBF) introduced a new scoring format in which 21 points rally format will replace the existing 15 points rally. Since then, it has became an official scoring rule. According to the basic badminton rules based on the new 21 points rally format, in order to win a match, players must score 2 out of the total 3 games. Players must score 21 points for each game. Bear in mind that ‘service over’ no longer applies for the new scoring format. That simply means player can score a point regardless of who serves. For double matches, only one service is allowed. Generally, other rules are still the same and is applicable for the new scoring format. In addition to the rules for the 21 points scoring format, players must also identify and understand other rules and regulations before you start a game. Basically, before you start a game, a toss shall proceed and the person who wins the toss have the final to say to choose whether to serve or play first. To begin with, let’s take a look at the rules for single matches. When a player scores an even point in the game, he/she must proceed to serve from or receive in the right service court. Meanwhile, player shall serve from or receive in the left service court if they have scored an odd point in the game. The game will continue in which the players will take turns to hit the shuttlecock alternately unless a ‘fault’ happens. Fault will be dealt later. A player scores a point if the opponent makes a ‘fault’ or when the shuttle drops on the opponent’s side of court. The same rule applies to every player in which no score would be granted if the shuttle touches your side of the court. Subsequently after every ‘fault’, serving right will be given to the opponent. On another note for double matches, when a player serves, he/she shall only serve from right service court. And only the opponent facing diagonally on the other side of the court can return the service or hit the shuttle. Say for example if the opponent’s partner somehow touches the shuttle, you will gain a point. Right after your opponent returns the service, the shuttle may hit by you or your partner from anywhere around your side of court. Same rule applies to your opponent. The game continues until the shuttle hits the ground. As mentioned beforehand, if a player makes a ‘fault’, then the other side will score a point. Here are some of the situations that can be considered as faults – if the shuttle touches the surface outside of court’s border or could not pass over the net or when the player passes over the opponent’s side of court; when a player distracts the opponent by screaming or making funny gestures; or when a player hits the shuttle more than once.